Since we can't actually follow celebrities 24/7 to be privy to all the intimate details of their lives, media outlets usually have to rely on guesswork and anonymous sources to get the news out before anyone else. Naturally, this leads to a lot of them getting things wrong. While most of the fake news stories are harmless or simply sensational, some of them can be truly damaging. That was the point that George Clooney made in his USA Today op-ed slamming the Daily Mail for printing a false story about his future mother-in-law disapproving of his marriage to Amal Alamuddin on religious grounds. "[The story] says they joke about traditions in the Druze religion that end up with the death of the bride. 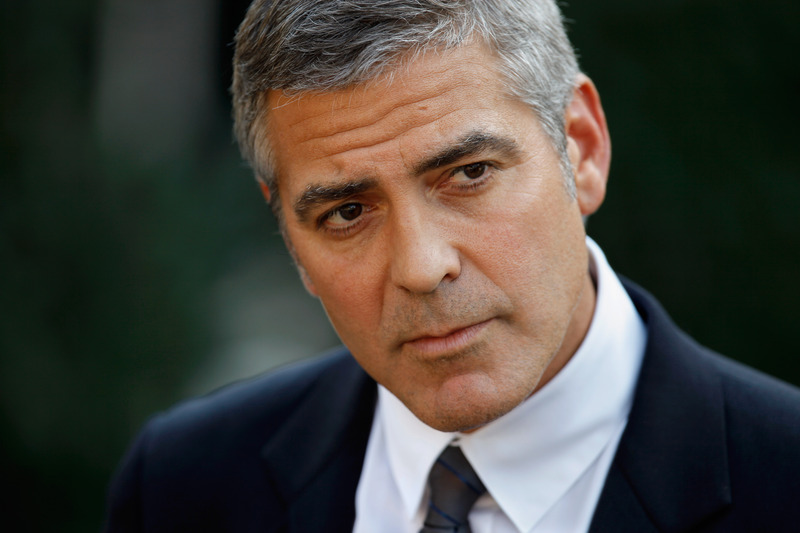 Let me repeat that: the death of the bride," said Clooney in his op-ed. "The irresponsibility, in this day and age, to exploit religious differences where none exist, is at the very least negligent and more appropriately dangerous. We have family members all over the world, and the idea that someone would inflame any part of that world for the sole reason of selling papers should be criminal." Clooney, of course, has a point. The number of times that the media gets it wrong are so numerous that most of them aren't even worth replying to — or even become a joke for the celebrity who is the subject of the false story — but a rumor like this one had too much potential to offend too many people. While we're glad to hear that Clooney and Alamuddin won't be torn apart by a religious dispute, we do feel suitably chastened by Clooney's words. However, this is far from the first, or even the last, time that a rumor is going to float around that's damaging to a celebrity. In fact, we've ranked seven of them from least harmful to most harmful. What Happened: In May 2014, Justin Bieber was accused of attempted robbery when it came out that he tried to wrestle a cell phone from the hands of a mother who was taking pictures of him at a golf course. Denied By: Justin Bieber, who tweeted a link to a golf course employee who was denying the story with an accompanying YouTube video. The charges against him were later thrown out due to insufficient evidence. Damage Caused: None. At this point, Bieber's reputation could literally not be worse. What Happened: In May 2014, the Internet collectively rejoiced when it was reported that Jessica Chastain was offered a lead role in True Detective season 2. Denied By: Jessica Chastain's representatives, as confirmed by E! Online when they investigated the story in breathless excitement like the rest of us. Damage Caused: Minimal. The True Detective season would have been magnificent with Chastain in it, but that's a disappointment we'll fully get over when we get our real leads. What Happened: In April 2014, it was reported that Naya Rivera had been fired from Glee for throwing a fit on the Glee set and amidst rumors of a feud with Lea Michele. Denied By: Naya Rivera's representatives, who declared the story a complete fabrication, okay, bye. Damage Caused: Ongoing. Rivera might not have been fired, but she was written out of the season finale and was demoted to reoccuring character in the next season. What Happened: In March 2014, rumors were flying that Chris Evans was quitting acting to focus on directing. Denied By: Chris Evans, who spoke up to say that he had no plans of quitting acting and instead just planned on directing more movies in addition to acting. Crisis averted. Damage Caused: Bad. Look at Chris Evans. Look at Chris Evans. Now imagine never seeing that face again and you'll understand the heart attacks this story caused. What Happened: In July 2014, Nicki Minaj threw shade at the BET Awards and everyone immediately assumed that she was throwing it Iggy Azalea's way. Denied By: Nicki Minaj, who wrote a series of tweets denying that she was calling out Azalea, blasting the media for making these things up, and reiterating that girl feuds are so last year. Damage Caused: Bad. Let's just say that Azalea's fans did not take Minaj's shade well and leave it at that. What Happened: In July 2014, Mya was accused of having an affair with Jay Z and she was just the latest female artist to be accused of it in the wake of the rumors that Beyoncé and Jay Z's marriage is on the rocks. Denied By: Mya denied it on Instagram because "illegitimate, thirsty sources" need to step up off her. Damage Caused: Really bad. This is the sanctity of marriage, and Queen Bey's life, that we're talking about here. How about we not? What Happened: While Tracy Morgan was busy recovering at the hospital, someone decided to start a rumor that Morgan had had his leg amputated after a surgery. Denied By: Tracy Morgan's representatives, who denied the rumors and requested that the media wait for official confirmation before spreading those kinds of filthy lies. Damage Caused: Horrible. Morgan's family is having a trying enough time without going online to find stories of limb removal floating around. That was the most irresponsible rumor of the year... so far.